The 800 employees at the East Yorkshire bus company are celebrating today after their firm won the coveted “Large Bus Operator of the Year” Award at a presentation dinner attended by over 600 people from the bus and coach industry last night. This particular award is for bus operators running over 100 buses, of which there are over 100 in the UK. The RouteOne Operator Excellence Awards are run by one of the industry’s main national trade magazines and are judged by a panel with a wealth of experience in and beyond the coach and bus industry. East Yorkshire Motor Services, which trades as Scarborough & District in the Scarborough area, is the largest subsidiary of Hull-based EYMS Group Limited, and runs 320 buses and coaches throughout Hull, East Yorkshire and in parts of North Yorkshire. East Yorkshire was also shortlisted amongst the top five for the Operator Training Excellence Award, and the company’s chief engineer, Dave Heptinstall, was one of the three finalists for the Bus Engineer of the Year Award. Nine members of the EYMS management and training teams, and Nick Bardsley from the company’s training partner Springfield Training Limited, were at the dinner to see chairman Peter Shipp and finance director Peter Harrison receive the trophy and certificate. The prestigious award was made at the end of the presentation ceremony which included several other awards to individuals and smaller bus and coach companies in the bus and coach industry. The dinner, at the National Motorcycle Museum in the Midlands, was hosted by RouteOne editor Mike Morgan and BBC sports commentator John Inverdale, and comedian Roy Walker provided the after-dinner entertainment. The judges said “this is one category that certainly did not disappoint us! Each of the five shortlisted companies was able to stake a worthy and very valid claim to being among the best in the business. However, one company stood out from the rest by virtue of the evidence it presented which showed that far from resting on its laurels it is constantly seeking and exploiting new initiatives that maintain an already impressive record of growth”. “There can be nothing but respect for a company that maintains its investment levels and constantly evolves as a modern bus operator whilst still maintaining its traditions. What’s more it has strengthened its position. This is a large bus operator that has more than held its own”. The judges were looking at all aspects of the business, including consistently high vehicle maintenance standards over the last few years, significant innovations and training developments over the last 12 months, a record of constant investment in the fleet, service reliability, and anything else which made the business stand out in terms of operating excellence. 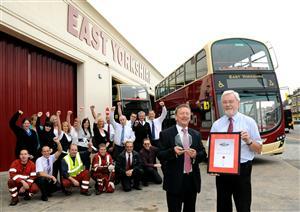 Peter Shipp, Chairman and Chief Executive and Peter Harrison, Finance Director, celebrate the award with help from East Yorkshire Motor Services staff.